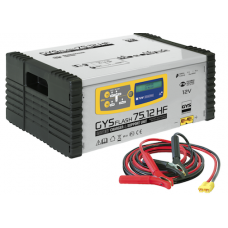 During diagnostic work, the Gysflash 75-12 HF provides all the energy needed by the vehicle up to 75A (in accordance with manufacturers’ recommendations), avoiding risk of damage due to deep battery discharge. Gysflash 75-12 HF delivers a 13.5V stabilized voltage. It can be defined by the user from 12 to 15 V (0.1V steps).